Just kidding. I am, of course, talking about the trapezius muscles, which extends along part of the neck and down the shoulder blades, whose function is to support the arms, move the shoulder blades… and make you look superhuman. 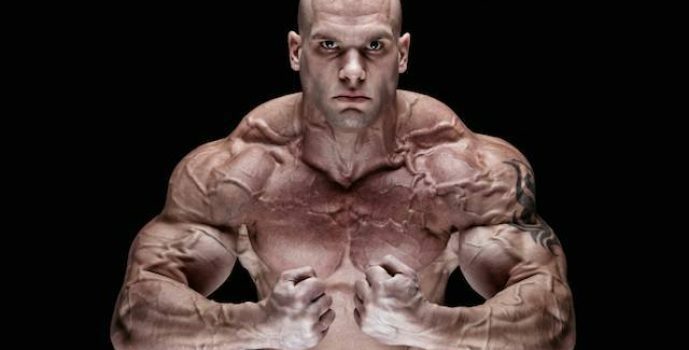 Powerful, bulging traps are eye-catchers that give a real powerful look to your physique. There’s no denying that even on a physique lacking in other areas, a big trapezius muscle can make it stand out from the crowd. Few lifters are naturally blessed with large trap muscles, contending instead with ordinary, flat ones. But how do you build bigger traps? You can shrug until the cows come home (or like you’re chronically unsure about everything), but nothing much will come of it if you’re not doing it right. Fortunately, I’ve got you covered – continue reading and discover some top tips to building intimidating traps that command respect! Hold it right there… Try lighter weights when working your traps. Heavy is not always better. More importantly, concentrate on powerfully holding the weight for a couple of seconds when your muscles are fully contracted. If you cannot achieve a powerful contraction that can be briefly held, you are trying to lift too much weight, which damages the quality and gain potential of every repetition. Using a lighter weight, focus on the trapezius muscle shortening and tightening as you contract and raise the shoulders. Hold the weight and squeeze the muscle before slowly lowering the shoulders to the starting position. Get a grip. Strap it on. Maybe that last line could be changed. Regardless, if you find your grip failing you, don’t be afraid to acquire good quality lifting straps. Weight lifting straps attach to the wrists and assist in getting a good grip on the weights. There is nothing “wimpy” about using a well-made tool to get the job done. Straps help take your focus and worry away from maintaining a grip on the bar, to instead concentrating on contracting your traps. Ronnie Coleman and Jay Cutler use lifting straps for a reason, and there’s nothing “wimpy” when you see those guys using straps. Quality counts. I’ve discussed good form and how to perform reps correctly before. 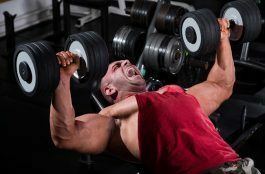 If you don’t focus and concentrate on what’s happening when you lift – how long each portion (concentric, pause and eccentric) of every repetition is; ensuring the target muscles are being worked; being aware of normal soreness versus problematic pain; applying steady intensity to each rep – you miss out on maximizing gains. Make every rep a high quality one that counts. Use good form, with smooth, fluid movements. Don’t lift too quickly, or jerkily. Not only will that result in poor target muscle contracting but could easily lead to tendon damage. As a bonus, maintaining good form with trap exercises will further your ability to do it with other types of lifts, because the range of motion involved in exercising the traps is relatively small. Twice is nice. Who ever said that the trapezius muscles should only be worked once every seven days? Someone must have, because it seems taken for granted that that’s just the way it’s done. Between shoulder and back days, work your traps, not once weekly, but twice. Not only will you target them in isolation, but work them indirectly when you train your shoulders and back. Not every set needs to be the same. Use lighter weights and more reps; then switch to heavier weights and lift fewer reps, as four or five, and as many as fourteen. Or, concentrate on the eccentric portion of the movement, resisting the weight as you bring it down. Incorporate some static holds for maximum muscle contraction. Locking out the joints when lifting is not normally advisable, but if done with caution, it can yield good results. By keeping the elbows locked, straight and immobile, you force your trapezius muscles to do more work; conversely, allowing the elbows to bend may cause you to inadvertently help lift the weight with the upper back. When performing a dumbbell shrug, lean a bit forward. Why? Because more of the trapezius is used when the body is so positioned. The benefit? Increased muscle fiber recruitment and the ability to lift heavier. If your grip strength is lacking, in addition to using lifting straps, you can try doing trap shrugs while standing in a position that puts your weight on your heels, preventing your body from shifting up and down. This encourages good form and greater grip strength. Incorporate different exercises such as shrugs with dumbbells, barbell, smith machine, cables, shoulder pad calf machine and upright rows. 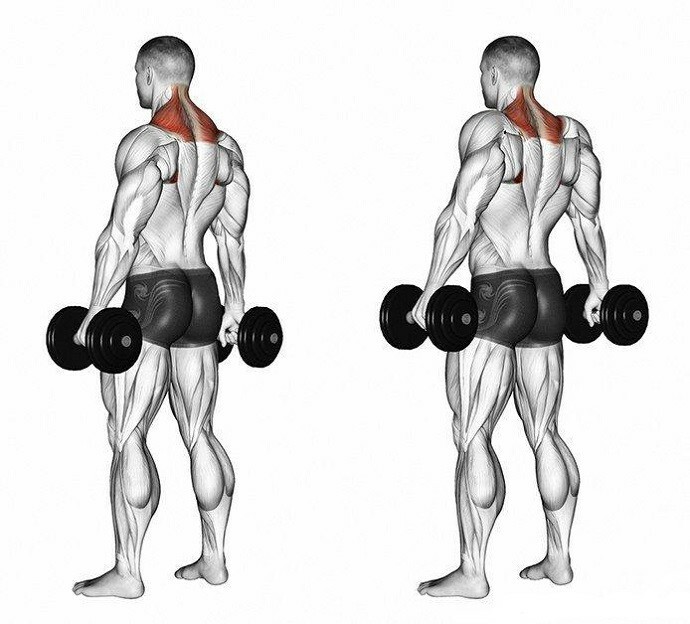 The trapezius muscle may be small, but the effect of hitting it hard with good form is mighty. Don’t ignore this overlooked part of your physique; by incorporating regular, twice-weekly workouts and following the tips in this guide, you’ll have bigger traps in no time.